I can’t but repeat how much I enjoy this time of the year! All this fresh produce full of nutrients is abundantly available. Furthermore, the markets look so adorable that I choose to go there almost every day! So, when I laid my eyes on those juicy sweet cherries I immediately knew I was going to make gluten free vegan cherry muffins. And not just – they were also going to be chocolaty yet low fat! Don’t forget the tutorial video below! 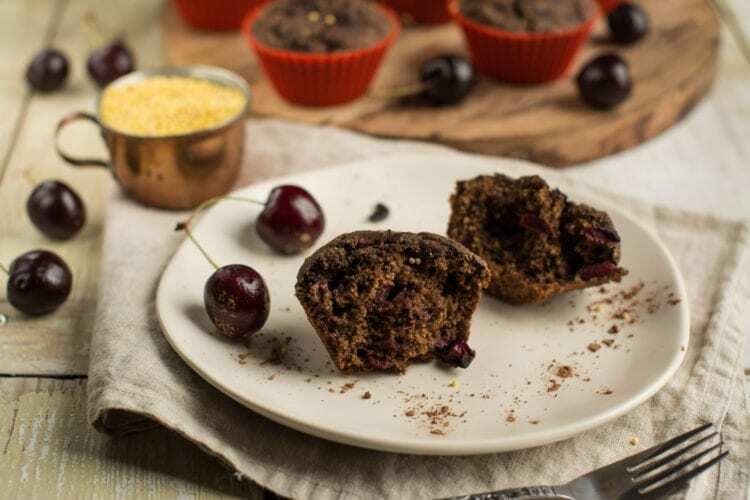 As I had a whole package of organic millet that needed to be consumed, I decided to use it in this recipe for gluten free vegan cherry muffins. If you are familiar with my healthy muffin recipes, you know that I use soaked grains rather than flours. In fact, my first muffin recipe that used soak-and-blend method contained millet as well – Subtly Sweet Blueberry Muffins. If you already didn’t know then soaking makes the grains more digestible and enhances mineral absorption by reducing the amount of phytates. I love millet because of its crunchiness. I’m one of those people who enjoy chewing on their food. Drinking my calories could never satiate me. 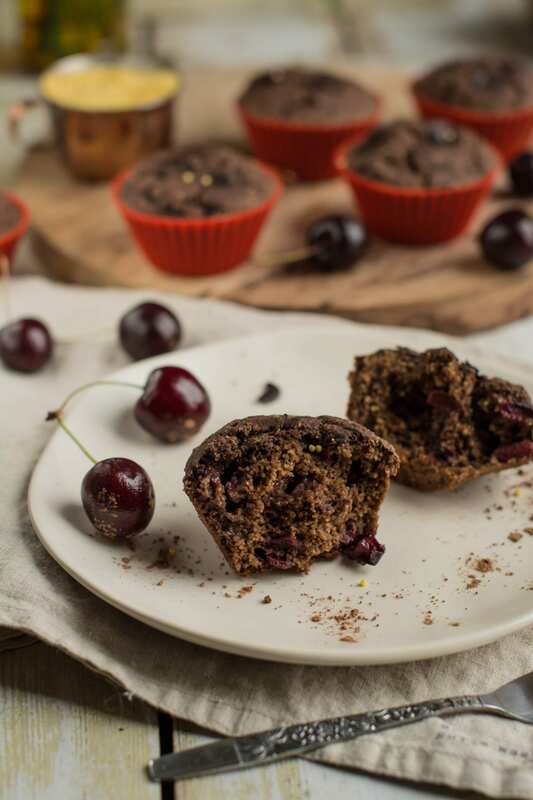 So, thanks to millet my gluten free vegan cherry muffins have a very nice chewy texture. Moreover, those muffins are only subtly sweet. However, the longer you chew on your mouthful, the sweeter it gets. Now, how come chocolaty yet low fat?! Only 12.8% of calories come from fat. Well, basically all my recipes are low in fat because I do not use oils or cooking creams. Furthermore, I also consume nuts and seeds sparingly – I only eat as much as needed rather than adding nut butters mindlessly into every recipe. 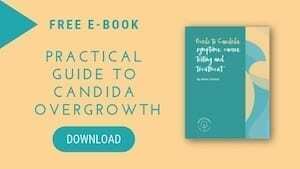 I wrote about calories-from-fat percentage in one of my recent posts Vegan Candida Diet – Living Candida Free After The Cleanse. I’ve discovered that the taste and texture does not suffer at all from being low fat! 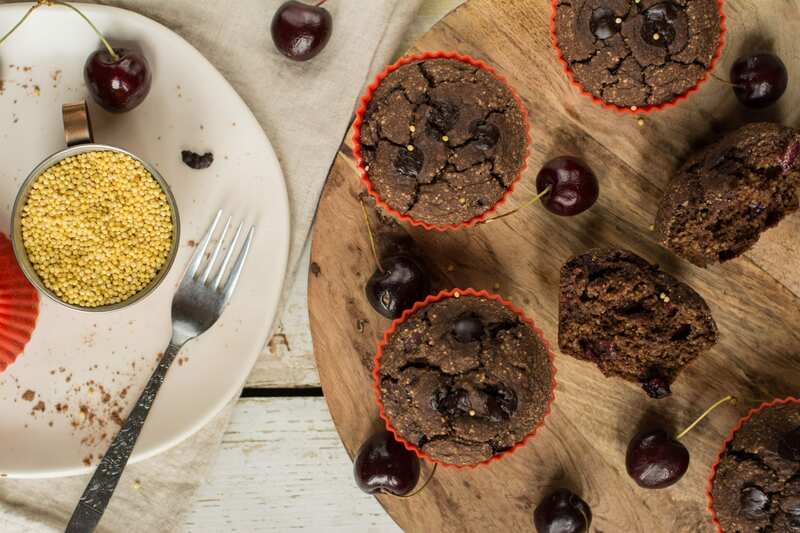 As you can imagine, my gluten free vegan cherry muffins get their chocolaty flavour from cocoa and carob powder. They remain low fat because I do not add any nut/seed butters or oils to this recipe. 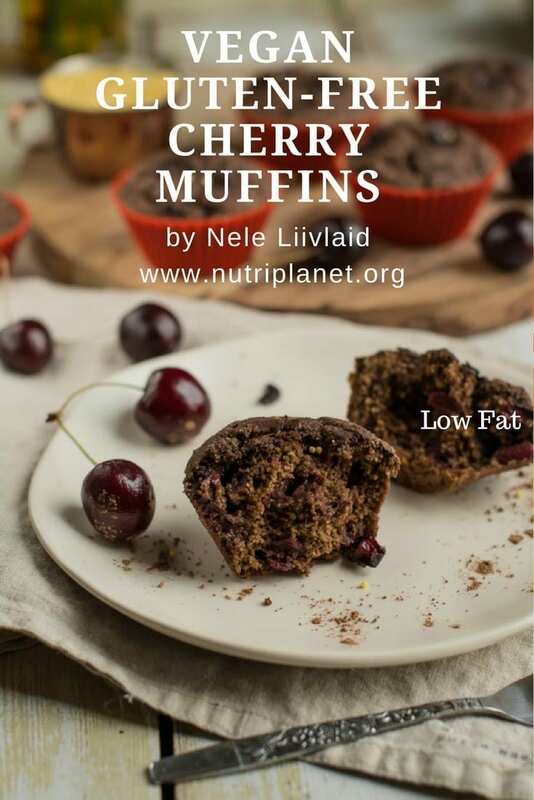 As repetition is the mother of all learning, my gluten free vegan cherry muffins with millet are low fat, oil-free and Candida diet friendly. First, soak millet overnight (or all day). Wash and drain. It soaks in about 30g (1oz) of water. Put all ingredients except baking powder and cherries in blender and blend until smooth batter is formed. Now, blend in baking powder. Finally mix in (DON’T BLEND) chopped cherries. Divide the batter between 6 muffin moulds, sprinkle on a few dark chocolate chips or chopped dark chocolate and bake for 33 minutes until the muffins are done. These muffins make a delightful breakfast or mid-morning/afternoon snack with tea or coffee. Nutritional info per ⅙ of recipe (calculated with 100g rice-coconut milk, 100g almond milk and 4g of chocolate chips): 146 kcal, 21.9g carbohydrates (74.5%), 2.28g fats (14%), 4.21g protein (11.5%), 3.24g fibres, and 14.47 GL (glycemic load) points. I used half rice-coconut milk and half almond milk. However, you can choose any unsweetened plant milk. You might want to add another tablespoon of xylitol, if you add unsweetened and naturally NOT sweet plant milks. Carob can be substituted with cocoa and vice versa. Remember, that carob has a sweet taste whereas cocoa is bitter. The muffins turn crispy on the outside quite quickly. Should you prefer them soft, put them in a container (while they are still a bit warm) and cover with lid until they soften. However, don’t leave them like this for a long time as mould may develop. Finally, store any leftover muffins in freezer and heat up in (micro)oven whenever needed. I have serious health’s problem especially constipation but I am vegetarian over 10 years,still having this problem. Your diet is low in fat. But fat can lubricate the colon. High fiber’s foods has problem if no oil added as I have IBS problem. What is your suggestion? Thanks! Make sure you drink enough water! If you get a lot of fibre, but don’t drink enough, you might get constipated. On the other hand, when you drink enough and get a (mild) diarrhoea, then it might mean that your fibre amounts are too high. And of course you get constipated when you get too little fibre. I get enough healthy fats from whole foods, i.e. nuts, seeds, avocados and olives. Even grains, legumes and veggies contain fat. I get 50-60 grams of fibre every day and this does not cause any problems. I had digestive issues when my fibre consumption was around 80 grams daily. However, I ate too much oat bran back then. When I cut that back a bit, my fibre numbers went back to normal and so did my digestion. I’d advise you to consult a doctor if you continue having digestive issues. Thanks for the recipe! Wouldn’t it make sense to soak oats as well? Or would they become too gooey? You’re welcome! You could soak them as well, but then use the plant milk from the recipe, i.e. do not add any extra liquid to the recipe. I made these yesterday and you have been confirmed to be my angel in the kitchen! They are so easy and so delicious!!! I used pureed cauliflower instead of the applesauce (you really must try it – chocolate and cauliflower are an amazing combination), cashew milk, trehalose for the sweetener, all cocoa instead of half carob and frozen cherries. I also only used half the baking powder since I am really sensitive to tasting it when I use much more so mine didn’t seem to rise quite as much either. But iI actually love the more gooey inside and crispy outside. They turned out so perfect I hope I can replicate them!!! I like that they aren’t overly sweet. I love chocolate breads that still retain some of their bitterness. And they are amazing toasted and topped with some peanut butter. Yum yum yum. They really hit the spot. I was thinking I would have to freeze some of them but I don’t think that will be an issue since they are almost gone already. 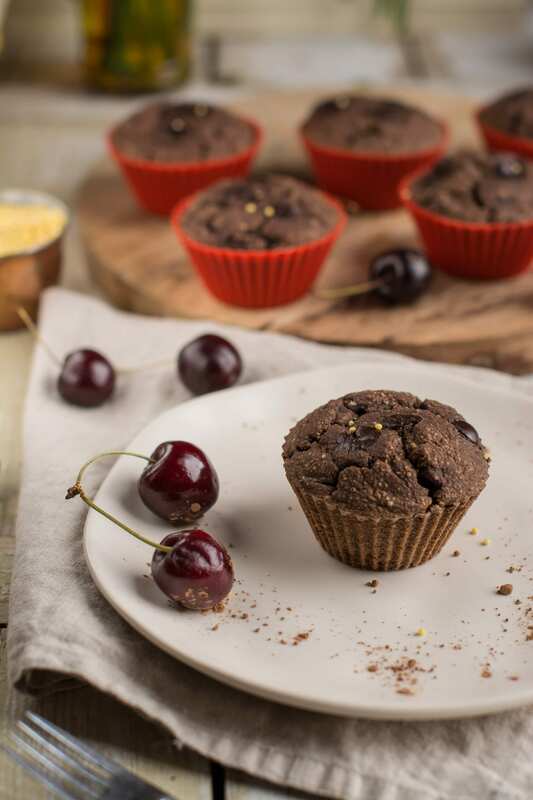 You definitely win the prize for best chocolate cherry muffins ever!!!!!! All the best and happy baking/cooking! I too have LOTS of trouble with cauliflower – especially raw and if I eat it alone. However, I seem to do better with it if it is lightly steamed and then either cooked into a baked goods like this or I have it with some other foods. I hope the same is true for you, because I suspect you will enjoy the results. And if chocolate muffins can facilitate cauliflower consumption, then I am certainly not going to argue. I just polished off the last of mine for breakfast this morning – toasted with some walnut butter. Amazing. I seriously haven’t enjoyed breakfast this much in a long time. Truly. I am forever grateful. So I better get more millet soaking right away so I can make another batch ASAP. Heaven forbid I have to start a day without one now! And… I totally get you 🙂 I have muffins almost every day as well!